Why Review Your Motor Trade Insurance? If you own a motor trade business involved in the buying and selling of new and/or used cars, MOT centre, tyre fitter, car valeter or a garage servicing and repairing vehicles then you will no doubt have motor trade insurance in place. However, when did you last review the level of cover that you have in place to make sure that it is adequate to meet your current needs? Furthermore, when was the last time that you reviewed how much you are paying for your cover? If you own your business premises then is the amount that you have the premises insured for sufficient bearing in mind that property values may well have increased significantly over the last few years. Have you purchased additional plant and machinery since you arranged the cover? If so, is the level of cover enough to replace these things should they be destroyed in a fire or stolen? As your business has expanded, have you increased the levels and value of stock that you carry on the premises? If so, have you also increased the level of cover within your motor trade insurance? Is the level of employers liability cover adequate should you be subject to a claim by an employee who may have been seriously injured whilst at work? Is the level of public liability cover sufficient to meet any claim that a member of the public may bring against your business say due to slipping on the floor at the business premises and injuring themselves? You may wish to get one or more competitive quotes if your existing motor trade insurance policy is shortly coming up for review. There are many insurers all of whom will probably be interested in taking on your motor trade insurance so you may be able to get the required level of cover but for a lower premium than you are currently paying. It doesn’t take too long to get one or more comparison quotes so why not do so via our website as we provide access to a number of different insurers. We look forward to being of assistance. Do You Have An Adequate Level Of Business Interruption Cover? If you own a business within the motor trade industry such as a garage involved in the servicing and mechanical repair of vehicles then you will no doubt have motor trade insurance in place to cover you for a variety of risks. An optional extra with such policies may be for business interruption cover. Such insurance is geared up to replace lost income and pay for certain expenses following say a major fire at the premises perhaps resulting in you having to close down the premises for a period of time until it is repaired and the plant, machinery and stock is replaced. In the meantime, you may need to relocate to alternative temporary premises and this can be a costly time to the business as it could take some time to move your business operation to the new temporary premises. This is where business interruption cover may be of assistance but it is important that you do all that you can to source a motor trade insurance policy that provides the level of cover that you require. There are so many things that you will need to take into account should such a thing happen to come up with a estimate of how much cover would be required should an unfortunate event occur at the business premises. For instance, you will need to consider what loss in profits your business is likely to incur, the additional expense in moving premises and, let’s not forget, moving back again once the premises are ready for occupation and expenses such as paying your employees wages and rent whilst the business is not functioning. Having established what the likely amount is that is going to be needed, you can then try to source an insurer that will provide the level of cover that you require providing you with complete peace of mind. In this respect, why not get in touch with us and we will do all that we can to help you achieve this as there are so many providers of motor trade insurance. Motor traders may find it of interest to read that, according to the Confused.com Car Insurance Price Index produced in April 2018, the average cost of fully comprehensive car insurance fell in the first quarter of 2018 when compared with the same quarter last year. There was a reduction of £13 to £768 per annum with this equating to a 2% drop. You may be asking what relevance this may have to those people running businesses within the motor trade industry. Well, if your motor trade cover insures you and certain employees to drive either company and/or customer vehicles then it may be that when your motor trade insurance policy comes up for renewal that the cost of such cover may have fallen a little. If you are a motor trader then you will no doubt be insured to not only drive cars owned by the business but also to drive vehicles that are owned by customers who you may be considering buying the car off but want to test drive it as part of your due diligence before committing to purchase the vehicle. In your case, you may see a bigger reduction in the cost of cover than if you run a motor mechanics business as it is quite possible that a motor trader may spend more time driving more cars each year than say a motor mechanic. If you are looking for motor trade insurance for the first time or your existing policy is shortly coming up for renewal and you have received a renewal quote then why not give us a call here and we will do all that we can to try to source the cover that you require but for a more competitive premium. It will cost you nothing apart from a little bit of time to establish if we can save you some money on a regular monthly basis. We look forward to hearing from you. There are a variety of businesses involved in the motor trade industry many of which require specialist insurance cover. One of those is those operating within the vehicle repossessions sector. If you are spending the day calling around either at a motorist’s home or their business premises with a view to either obtaining a payment in reduction or to clear their indebtedness to the likes of a finance company or to repossess a vehicle then you will no doubt be aware that it can be a stressful job. It is important that you are suitably insured to protect you against a number of risks. For instance, if you end up taking possession of a car then you may well be going to drive the vehicle away and deliver it to either the finance company or its representative. In which case, you will wish to make sure that the car is adequately insured for you to get behind the wheel and drive it off. In that respect it is possible to arrange a form of motor trade insurance often referred to as “repossessions agent insurance’. Such insurance could also provide cover for the likes of your commercial buildings, the storage of vehicles that it has been necessary to repossess as well as employers and public liability. These are important things that may wish to insure. For instance, if your business premises were to be burnt down along with all the vehicles that you had repossessed in the past few days that were stored in it then, if you did not have suitable cover, the potential loss could be huge. Far better to pay out x amount per month for the peace of mind of knowing that you are covered for such a risk. What would happen if one of your staff was beaten up by the owner of a vehicle that you were being asked to repossess resulting in him or her being unable to work for a considerable period of time or perhaps never being able to work again. Well, if you had repossession agents insurance and had included employer’s liability cover then you would have some cover in place should your injured employee decide to sue you for the impact their injuries had had on them i.e. being unable to work thus affecting their income or requiring medical treatment. We trust that the above has been of benefit and look forward to receiving your enquiry about obtaining a quote for this type of motor trade insurance. Is There A Benefit In Paying Monthly For Your Cover? If you are a motor trader or run another type of business involved in the motor trade industry such as a car repair business or an MOT testing centre then you will no doubt have motor trade insurance in place. Usually, you can either pay for the cover on a monthly or annual basis. So, what is the benefit is paying monthly? Well, the obvious benefit is that it can aid cash flow as the cost of providing such cover will usually be spread over a 12 month period. This may be of particular benefit to someone just setting up in the motor trade as he or she will no doubt have numerous other costs when starting out on a new business venture such as buying and fitting out business premises. If you were to pay for your cover on an annual basis then this would involve you having to find the total cost of the cover for a year in one lump sum and this may prove difficult from a financial point of view. A downside in deciding to pay monthly is that insurers often charge interest on top of the normal annual premium as, to all intents and purposes, you are borrowing the money from the insurance company. With so many insurers providing motor trade insurance it is worth shopping around for the cover. You can either do this yourself or use the likes of a broker. Do bear in mind that if you decide to research the cover then this will involve you in setting aside some time to do this. One of the quickest ways is to go on the Internet and use the likes of a price comparison website that has access to a large number of insurance companies. You could also use a broker to do the research for you and help select a suitable insurer. There are many different types of trades people working within the motor trade industry apart from some of the most common such as motor traders and mechanics carrying our mechanical repairs and servicing. For instance, there are windscreen fitters who replace or repair windscreens either at their own business premises or who are mobile operators or some could be both. 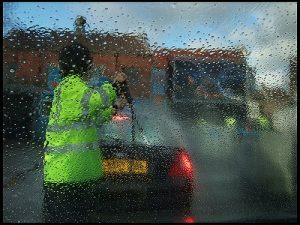 If you are a windscreen fitter then you will no doubt wish to consider motor trade insurance to cover a variety of risks depending upon whether you operate from premises or are mobile. For instance, if you have customers who bring their vehicles to your business premises to either repair or replace a windscreen then you will wish to make sure that the premises are insured if that is something that you are responsible for i.e. if you own the premises or if the rental agreement stipulates that you have to insure the premises. You may also wish to ensure that any tools and equipment and fixtures and fittings are covered. You will no doubt need to drive some of the vehicles owned by your customers in and out of the premises so you will want to make sure that you are covered for doing that as, if you had an accident whilst moving the vehicle, you would not want to be faced with a potential repair bill that could run into thousands of pounds that you had to fully pay for yourself. Should you injure either a customer or one of your employees perhaps through them tripping over something at the business premises then you will be pleased to hear that public liability cover and employer’s liability cover can be arranged within a motor trade insurance policy. A mobile windscreen fitter will wish to ensure that suitable cover is in place such as public liability, employer’s liability, cover for tools and equipment carried on the van, cover for faulty workmanship and cover for driving customers’ vehicles. So, if you are a windscreen fitter, why not get in touch with us in order to discuss your requirements and obtain a competitive motor trade insurance quotation. There are many different types of business that require motor trade insurance with one of those being tyre fitters. There are numerous businesses of this type around the UK and it is important that they have adequate cover in place. So, what sorts of risks may a tyre fitting business need to insure against? Well, if the business is responsible for insuring the premises that it is operating from then it will require suitable buildings insurance so that in the event of the likes of a fire there is suitable cover in place to be able to deal with the rebuilding/repair costs to the structure of the building. Cover will also be required for plant and machinery such as jacks, tyre removal equipment and pumps to inflate tyres. You will also want to insure your fixtures and fittings as well as any of your customers’ vehicles they have left in your custody for a period of time. Cover will also be required for anyone involved in driving customers’ vehicles including driving a car into and out of the business premises and taking the car on a test drive. This cover will no doubt be arranged on a fully comprehensive basis. If you employ one or more staff then you will require employer’s liability cover in case one of your staff were involved in an accident at work and decided to sue you for say loss of earnings. Public liability cover will also be required in case a member of the public is injured at your business premises and decides to take you to court seeking financial compensation. If a member of the public had an accident caused by the likes of a new tyre that you have just fitted bursting as soon as he or she had left your premises then you would want to make sure that there is suitable cover in place to cover such mishaps as a claim against your business could run into millions of pounds. There are no doubt some other risks that you may require cover for so why not get in touch with us to discuss your motor trade insurance requirements in more detail. Do You Operate A Hand Car Wash Business? Generally speaking, car owners like to keep their vehicles clean – in particular on the outside. Many still wash their cars themselves or take their vehicle to a local garage and put it through an automated car wash. There are many hand car washing businesses in the UK. However, an increasing number of motorists drive to the likes of a trading estate where someone has set up a business to wash cars by hand that may or may not include a full valeting service that also includes cleaning and polishing the interior of the vehicle. The writer of this post uses such a service as it seems to be competitively priced in his locality. It would be interesting to know if all such hand car wash businesses have arranged suitable insurance cover i.e. a motor trade insurance policy as such businesses should be insured. Presumably, some of these businesses do not own the premises that they operate from but merely lease the area onto which vehicles drive to be cleaned so it may be possible that they do not require buildings cover. However, what if one of the hand car wash operatives scratched a vehicle that he or she was washing perhaps whilst using a jet spray wash? The business would presumably be responsible for the cost of having the damage repaired. It is not uncommon for the owner of the vehicle to leave his or her car to be washed perhaps whilst they go shopping. This often requires the vehicle to be driven by a member of staff to the area where the vehicle is to be washed and/or to be parked up once washed awaiting collection by the owner. What if the staff member damaged the vehicle whilst driving it or the vehicle hit and injured a member of the public or another member of staff? These are just some examples as to why it is important that the owner of a hand car wash business should make sure that they have suitable insurance cover in place such as a motor trade insurance policy.